You are here: Home / Ent. / Support the Nipsy Hussle’s of Your Community. 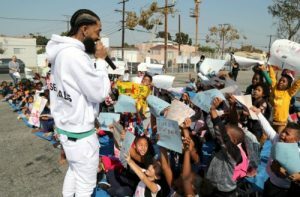 (ThyBlackMan.com) It has been sad for many, and heartbreaking, to hear that rap artist Nipsey Hussle was gunned down in the same community he was actively working to uplift. It was even more disheartening to read that a gang member is suspected as the gunman as Nipsey Hussle was working very hard to help put a stop to gang violence on those very same streets. As many people began to pour out condolences and share heartfelt messages all over social media it was only natural for many to become angry about how this brother lost his life. It began the discussion of why it seems we can’t give back to the community because no matter how much good one tries to do, they run the risk of being killed trying to bring hope. Many are not only grieving for the fallen rap artist, but also for his family. Nipsey Hussle leaves behind a wife, children, parent, siblings and many friends that are experiencing shock and grief on various levels. His death has placed more focus on his community work, than his music. There are many people that are mourning his death that never knew who he was before the headlines broke. Some people have never heard his music, but they respect the community work, and though he was a gang member they respect the fact that he was trying to do something about the problem. Since his passing we have seen great calls for community activism and involvement, and we have seen calls for unity amongst various rival gangs. It is important to give honor where it is due to the fallen, and the living. As we embark of the call for the community to come together, we must be honest with ourselves about community work. There are people that fight for our children and communities every day, yet we pay them no mind. They come from various professions but since they aren’t famous their cries for community unity falls on deaf ears. It’s so much easer to complain about “black on black crime” and gang violence than it is to make the time to mentor young black girls and boys. There are black business owners in your communities that hire our men and women out of jail to give them a chance at life, yet some of us think their prices are too high so we complain rather than support. The work Nipsey Hussle was doing is the work many have been doing long before he embarked upon his path, and it is the work more of us should be doing. Even when we look at rap artists, there are those that haven’t been nominated for Grammy awards and some that are local that have put their communities on their back. Why should we wait for something tragic to happen to recognize, and support their efforts? However, most of the people fighting for the community have no celebrity status…they aren’t rap artists or ball players. When will we open our eyes and begin to assist our own that are on the ground working everyday to better the community as they fight for the resources to get the job done? Bringing this disparity to light doesn’t lessen the remembrance of Nipsey Hussle. If we are going to have a call to community action maybe is should start by acknowledging the ones you see everyday that are sill here with you. There are brothers and sisters that have made our people their life’s work. Yet, they can’t get a moment of your time because they aren’t famous or deceased. At some point we must heed the call to action not just because a famous artist was killed, but because our children are killed in kind. Our hearts have to overflow for the community itself, and its future, before there is no future left. As we continue to mourn the loss of Nipsey Hussle, remember those doing the work that you see every day. Let’s move beyond someone dying for us to be galvanized to unity and betterment. We must be willing to fight for the living, verses just remembering the fallen.